It was shortly after Cora was born that we decided to upgrade our pillows and a year in and we have never looked back. 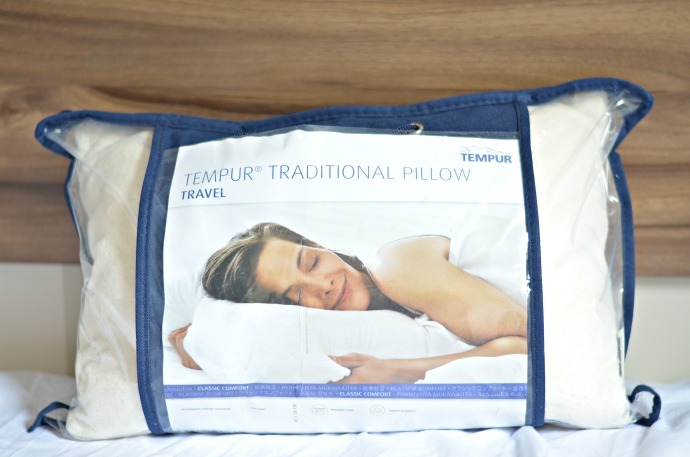 We tested them all out in the store and ended up Choosing some Tempur pillows in the end. Suddenly we have become pillow snobs, finding faults in hotel pillows and declaring our own bed to be quite clearly the comfiest one ever. This post comes straight from France where we are currently staying in a mobile home with a small double bed and some slightly flimsy pillows. I feel quite smug that I have packed my Tempur travel pillow and with the amount I am still up in the night with Cora, I am definitely glad to be getting more comfortable sleep when I can! So here are my 5 family travel sleep tips. If you are flying, then plan the times around the children so that they can sleep on the plain. We normally choose either an early morning flight so that they can be awake in the airport and then finish their sleep on the plane, or straight after lunch when they are more inclined to nap. Take your own pillow! My Tempur travel pillow is small enough to fit in my bags and their eye mask is super soft and thick and really blocks the light out. Good quality sleep makes all the difference. Pack the children's sleep cues, whether that is their favouite bed time story, a much loved bear or a dvd that they always watch in the evenings. Keeping their routine as normal as possible helps them to settle in an unfamiliar bed. If you struggle to sleep in new places then download some soothing tunes or ocean sounds to relax with and don't forget to pack your headphones if you are sleeping on the go! Going for a walk before bed can help expel any energy the kids have been storing and can be quite relaxing. Let them run off steam, take in the views and hope the fresh air helps them sleep more soundly. Do you have any sleep tips that you would add?